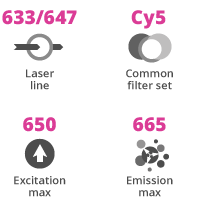 IR 650 Alkyne (IRDye® 650 Alkyne analog) is a water-soluble, bright, far-red fluorescent probe with excitation ideally suited for the 633 nm or 647 nm laser lines. 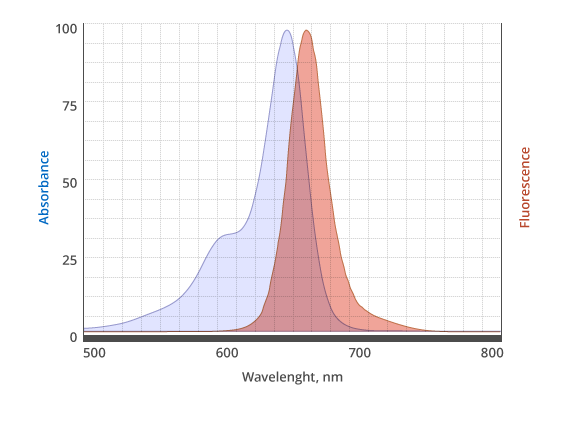 A significant advantage to using long wavelength dyes such as Cy5® Dye or Alexa Fluor® 647 dye over other fluorophores is the low autofluorescence of biological specimens in this region of the spectrum. IR 650 Alkyne is a bright, far-red-fluorescent, pH insensitive alkyne-activated probe routinely used for imaging of azide-containing biomolecules. IR 650 Alkyne reacts with azides via a copper-catalyzed click reaction (CuAAC) to form a stable triazole linker. A probe for copper-less detection (IR 650 DBCO) is also available for application where the presence of copper is not acceptable.